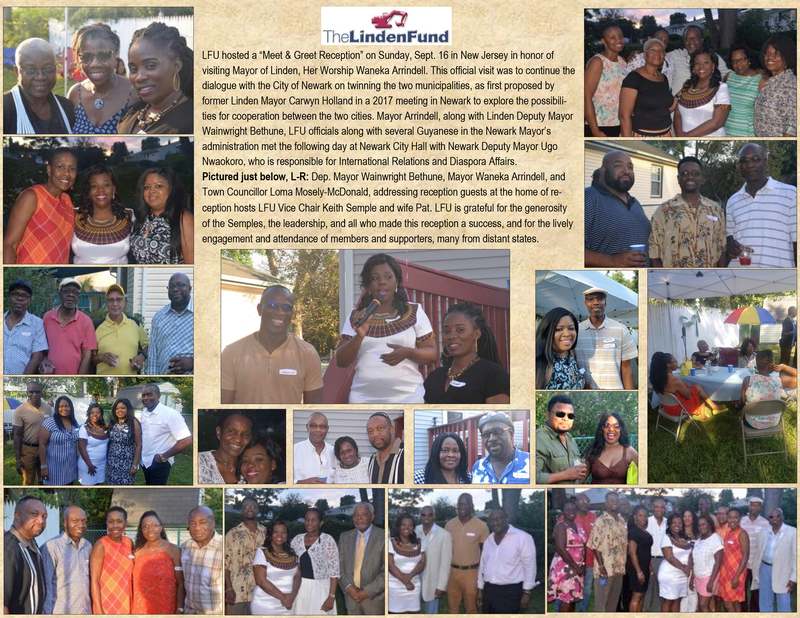 LFU hosted a “Meet & Greet Reception” on Sunday, Sept. 16 in New Jersey in honor of visiting Mayor of Linden, Her Worship Waneka Arrindell. This official visit was to continue the dialogue with the City of Newark on twinning the two municipalities, as first proposed by former Linden Mayor Carwyn Holland in a 2017 meeting in Newark to explore the possibilities for cooperation between the two cities. Mayor Waneka Arrindell, Deputy Mayor Wainwright Bethune, and Town Councillor Loma Mosely-McDonald addressed reception guests at the home of reception hosts LFU Vice Chair Keith Semple and wife Pat. LFU is grateful for the generosity of the Semples, the leadership, and all who made this reception a success, and for the lively engagement and attendance of members and supporters, many from distant states. At Newark City Hall on Monday, Sept. 17, LFU Chair Paula Walcott-Quintin, Vice-Chair Keith Semple, and LFU 20th anniversary committee co-chair Joan Casey were pleased to join Linden’s Mayor Her Worship Waneka Arrindell and Deputy Mayor Wainwright Bethune for continuing discussions with Deputy Mayor of Newark Hon. Ugo Nwaokoro on twinning the two municipalities. This initiative began in 2017 with former Linden Mayor Mr. Carwyn Holland who envisioned the possibilities for cooperation between the two cities. Joining Monday’s discussions in Newark, NJ, were fellow Guyanese who are part of the Office of the Mayor, including Executive Assistant in the Department of Finance Ms. Molly Etwaroo, City Planner Mr. Christopher Watson, and Senior Analyst for Economic Development Mr. Walford Enniss, who facilitated the follow-up meeting.